Epic is many things, but epic isn’t one of them. Visually stunning and a sweet but familiar story, for many this movie will bring back memories of FernGully and Thumbelina. Our main character is K.C., a seventeen year old who has moved in with her father after her mother’s death. She is a stereotypical female heroine thrown into an unknown world. She is given some depth with her family history and has more responsibility and adaptable personality than I have observed in similar movies which is a nice change. Her father is the perfect example of an absent minded professor who is researching a miniature but advanced civilization living in the forest that surrounds his home. K.C. is shrunk down when she meets Queen Tara who enlists her help to complete a mission that will save the forest from the villain, Mandrake, and his army of Boggans who want to spread rot and decay throughout the forest. With the help of the seasoned leafmen warrior Ronin, Nod, the dashing love interest, and the comic foils, a slug and a snail, she must help save the forest from total destruction (or should I say decay?). 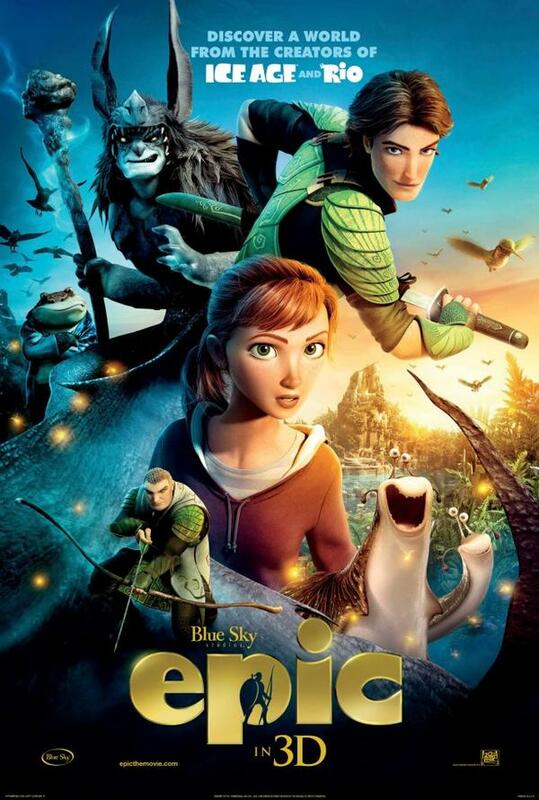 Epic matches the usual recipe for animated films, but it has its moments of brilliance. With an all-star cast you’ll find yourself rarely jerked out of the moment by their voices. The most recognizable voice is Beyonce as Queen Tara, but luckily her voice goes well with the wise but kind goddess of nature. Our villain, Mandrake, is refreshing in that he isn’t a nasty human with his machines there to cut down the forest, however his reasoning for his actions are not elaborated on making him a fairly weak but manageable villain. This is a film about saving the forest but doesn’t shove an environmental cause down our throats. The film carries several messages relating to family (both by blood and by love), team work, and nature but doesn’t force it on us. It allows us to come to these conclusions ourselves. Epic has its instances of uniqueness, but what I suspect is due to the five person writing team these moments are wrapped in a chaotic storyline. The visual effects deserve praise. The dazzling colors bring a beauty to the forest that can often be overlooked by people. There are also swooping air battles that bring to mind How to Train Your Dragon. With a slightly chaotic plot line, this is a movie for kids, but while it does lack those double entrées common in Pixar and classic Disney films it can still be enjoyed by adults. Overall this is a sweet story that can be enjoyed by most if you allow yourself to be pulled into their world. The acting was more than satisfying, the action and visual affects worked wonderfully, and the only real fault is not so much the story line itself but how it was handled. It is a simple light summer movie that will satisfy on a summer day.